O’Toole Design has unveiled a new video that explains our process for designing a state-of-the-art building like WWT, which you can view here! 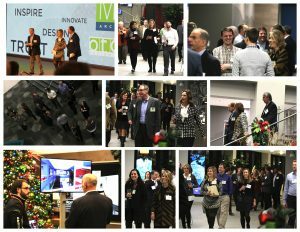 O’Toole Design and M+H hosted an evening event at our recently completed project, World Wide Technology Global Headquarters at Westport Plaza. With an outstanding turnout, we showcased our design as well as the immersive process. Several guests tried out the virtual reality goggles or used their cell phones to view 3D panoramic images of the space as they appeared during the design process. We are privileged to be a part of the role that World Wide Technology plays in propelling St Louis to be the “Silicon Valley of the Midwest”. Our work with WWT continues with the creation of their office spaces all over the globe. Our design for their building and its interior features is being touted as “setting the new standard for office buildings in St Louis”, according to local brokers who have toured the completed project. Let us know if your company would like a private tour of WWT’s HQ or would like to stop by our office to learn more about the 3D immersive design process. Large or small, let O’Toole Design help you with your next design project and make YOUR space work!